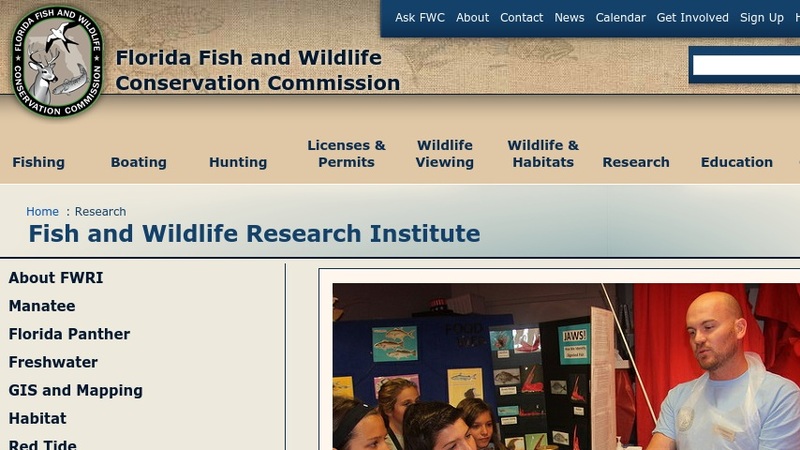 The Fish and Wildlife Research Institute (FWRI) was formed in 2004, under the direction of the Florida Fish and Wildlife Conservation Commission (FWC), by integrating parts of the Florida Marine Research Institute, the Division of Freshwater Fisheries, and the Division of Wildlife. Beyond "fulfilling the functions previously provided by three groups, FWRI added focus areas in spatial analysis, biostatistics and modeling, wildlife forensics, and socioeconomic research." The FWRI website contains information about research activities concerning Freshwater and Saltwater Fisheries, Marine Biology, Red Tide, and the Florida Manatee. The site maintains an extensive list of publications (from a wide range of years), some of which are downloadable, while others, if still in print, may be ordered at no cost. A number of Technical Reports published during the past decade are available for download as well. The site also links to information about FWRI partners, reference collections, and employment with FWRI.